Philipsburg, the capital of Dutch St. Maarten, fills a narrow stretch of land between Great Bay and the Great Salt Pond. Founded in 1763 by John Philips, a Scottish captain in the Dutch navy, it soon became a bustling center of international trade. Today it is as bustling as ever, with lively shopping streets, cafes, and hotels. Two main roads cut across the length of Philipsburg--Front Street and, yes, Back Street. Front Street, the main thoroughfare, is lined with duty-free shops offering everything from Italian leather goods and Japanese cameras to native crafts. Narrow alleyways lead in either direction to arcades and courtyards filled with flowers. 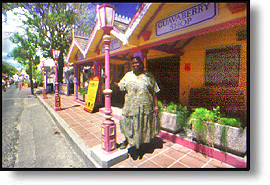 Visitors will also find examples of traditional West Indian architecture, including characteristic pastel-colored houses with second-story verandas looking out over the street. Front Street's most prominent landmark is the Courthouse, built in 1793. 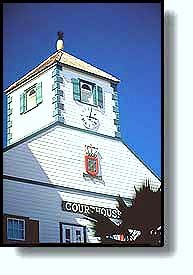 A grand white wooden structure topped with a cupola, it now serves as St. Maarten's courthouse. Also on Front Street is the Simartin Museum, which gives visitors an excellent introduction to local history. Among the artifacts on display are pottery from the island's original inhabitants, the Arawaks, and cargo salvaged from a British ship which sank off the coast in 1801. Two historic forts bear witness to Philipsburg's strategic importance in St. Maarten's history. Fort Amsterdam, built in 1631 on a peninsula between Great Bay and Little Bay, was the first Dutch military outpost in the Caribbean. Unfortunately, it was soon captured by the Spanish, who made it their most important bastion east of Puerto Rico. The Spanish abandoned the fort in 1648, and since then it has remained in Dutch hands. All military operations ceased in the 19th century, although the fort was used as a signaling and communications station into the 1950s. 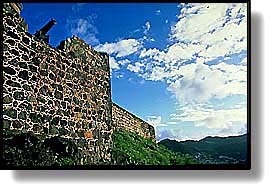 A few walls of the original bastion remain, and the site provides an outstanding view of modern Philipsburg. Fort Willem, easily recognizable by its television transmission tower, lies just to the west of downtown. Built in 1801 by the British, it was taken over by the Dutch in 1816. It's an easy hike up to the fort, with a lovely panorama of Philipsburg and neighboring islands at the top. Today, Philipsburg combines its historical legacy with 20th century excitement. Its waterfront has become a popular stop for cruise ships, and the town's many restaurants, cafes and night clubs offer entertainment well into the night. The town offers accommodations to suit every need, from modern resorts to intimate guest houses. This page, and all contents of this Web site are Copyright (c) 1996-2010 by interKnowledge Corp. All rights reserved.